Eaton CH Type standard L main circuit breaker load center has 30 circuits with 3/4-Inch space. 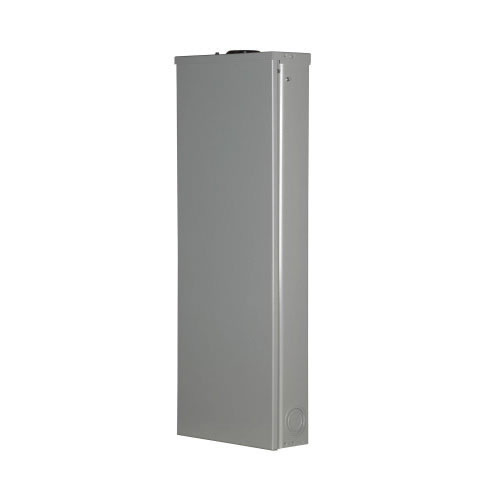 This 3-Phase, 30-Pole main lug load center has a voltage rating of 208Y/120/240-Volts AC, current rating of 150-Amps and an interrupt current rating of 10-Kilo-Amps. It features 4-Wire configuration with insulated or bondable split neutral connection. The load center has NEMA 1 indoor rated metallic enclosure with electrostatic powder-coat and baked urethane paint finish for added safety, strength and durability. It has silver flash-plated copper winding and copper bus cable of 150-Amps and 1-4/0-AWG copper or aluminum conductor for efficient performance. This load center measures 39-Inch x 14.3-Inch x 3.9-Inch. It has overhead or underground feed location and is flush or surface mountable. The main circuit breaker load center is flush or surface mountable. The main circuit breaker load center is UL 67 and UL 50 listed.